This message is very confusing for users. 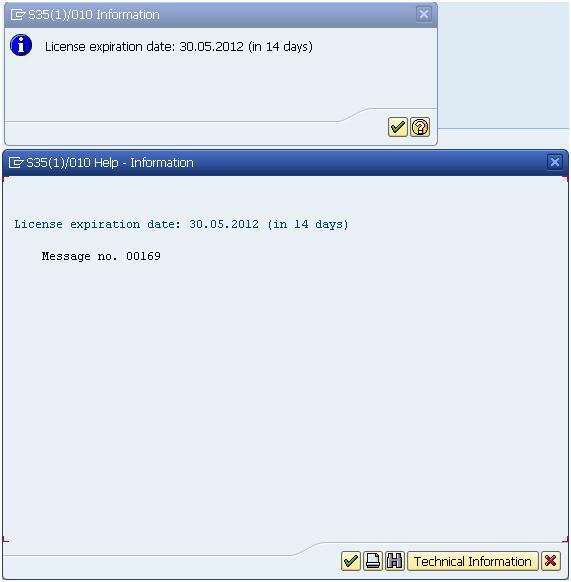 Once they do login into SAP system there is a pop up informing them that license is about to be expire. Basically it means that users won’t be allowed to logon into the system after expiration date. 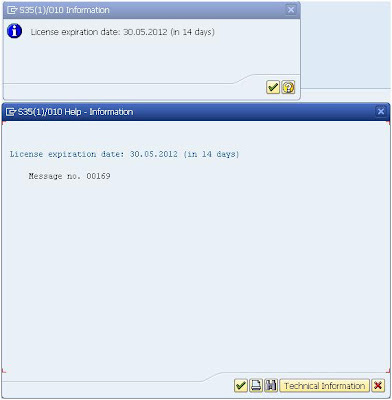 Then it is a task for SAP system administrator to prolong license in TA SLIC. 3. You get license from SAP by email and you need to install it via command on operation system level: "saplicense -install" or by using TA SLIC. and once Trailblazer becomes reality not only whole SAP Business Suite but even ABAP Application Server (AP) will run on HANA. You might think what is the big deal in here? If it is all SAP software written in ABAP why it should not run in HANA? 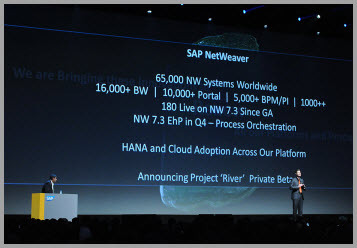 Here’s it is, HANA is in-memory technology, meaning you do not need really database to run it. Theoretically all take in place in in-memory. 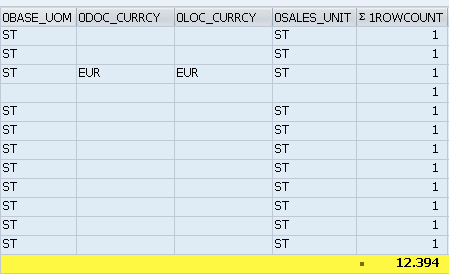 Imagine current processing of data in ABAP AS. ABAP programs first read data from underlying database’s tables and afterward performing business logic on this data. Finally data is stored back in database’s tables. Here’s perfect use case for HANA. All data is already in memory no need to read it from DB. So the deal is to “enable” ABAP to work with HANA instead of DB. In other words: ABAP to work with HANA DB. So ABAP’s logic needs to be pushed to in-memory DB which is HANA. SAP calls this approach as “code to data” paradigm. 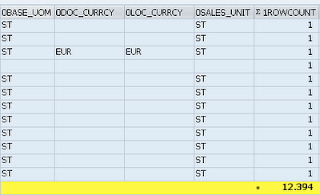 Notion of features that I’m discussing in this blog post are expressed by SAP in document SAP NetWeaver AS ABAP for SAP HANA. Of course this not near future but this future direction of ABAP Stack looks pretty promising. Not sure what next version of ABAP AS will be (7.4, 8.0?) but we can expect great application coming from thoughts like this. First Experience with ABAP for HANA – Evolution or Revolution? While checking data in infoproviders there is a functionality for checking no of records that exists in infoprovider object is available. It becomes very handy in case when you need quickly reconcile no of records in BW reports vs. actual records in e.g. cube. Functionality is available in selection screen of infoproviders. You can navigate here in TA RSA1->right click on infoprovider->Display data or in Manage screen of infoproviders->Content tabstrip. 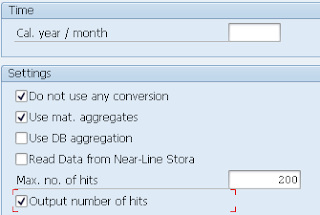 All you need is to flag "Output number of hits" check box. While doing so you get a one more column in your output screen. The column is called 1ROWCOUNT and it shows how many rows were used to form record that you see in the list. With this information you can easily do sum on this columns and get total no of records for your selection. In other words how many records were used to made up current record. To get total no of records in provider do not choose any characteristics nor key figure for selection. 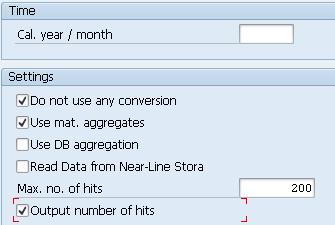 Then system gives you total no of DB hits that hits your selection criteria. To get total no of records exist in provider do not specify anything on selection screen. There are few transaction codes not very known for processing of list outputs. Actually they are not real transaction codes but are user interface codes (sy-ucomm) instead. Afterwards you get pop-up where you can enter format of the file into which you want ot save this particular output. So to sum it up you can you %PC to same any lists as local file. 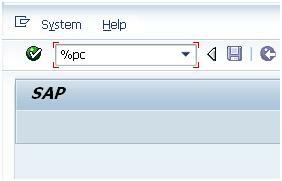 Again it is very helpful in case no standard icon of binocular is available in the toolbar of SAP GUI menu. Also continued search with can be achieved by transaction field code %SC+. Do you know basic components of BW from SMP perspective? PS: Be aware that every each of basic components has several sub-components sometimes even going into 5-6th level (e.g. BW-BCT-CRM-FM-LR - CRM Live Rates). For basic components of BusinessObjects software see here. Message appeared in my case when I attempted to browse an InfoPackage. If you get this error message InfoPackage is not accessible at all. I research on this message. I came across interesting site which pointed me into way how to resolve this error. Basically root cause seem to be in tables on ECC and on BW sides storing information on delta initialization requests. It might be that in BW table RSSDLINIT contains entry for initialization for specific data source. On other hand table ROOSPRMSC in ECC does not contain entries for the same. According note 852443 - Dump in include LRSSMU36/RSSM_OLTPSOURCE_SELECTIONS there are five scenarios that could happened. Two of them are mentioning ABAP report RSSM_OLTP_INIT_DELTA_UPDATE. This tool can be used to delete init selections in the 'Scheduler/Init selections in the source system' menu in the InfoPackage.